The beginning of Matgo came from Miniatura Shar pei, as we purchased our first girl from Rodney Connelly in 1998 TAYLA, there could never be another girl as beautiful, she was my baby, and from their we expanded and we were totally smitten on this beautiful breed.We also bought a boy from Dobomil Sharpei BRUCE, a horse coat boy, and there could never be another BRUCE in Micks eyes He ran our house, and lived to 13 years. We brought a boy in from New Zealand, Wu Yu Time Will Tell At Matgo (imp NZ) which gave our kennel the start we needed, (unfortunately we lost this beautiful boy in 2012 aged 9) Houdini is missed so much by us. We then decided to bring in another boy from United Kingdom (Ch Inisbua Red Dragon Imp Uk) who has produced many champions and given us many BIS,RUBIS , and also Classes IN SHOW & IN GROUPS. He is still with us, and going on 10 years. 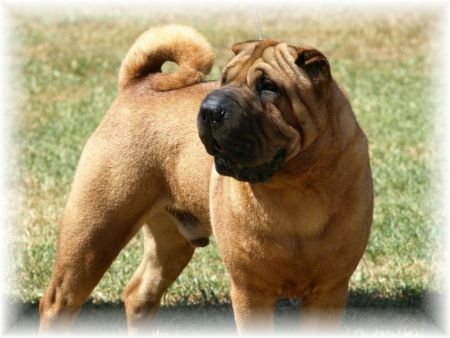 Our SharPei have excelled at BIS and BIG level, also having the best temperaments, and good health..